The title of this map of London appears inset in the top border, with the publisher's imprint below the plan. Open spaces, city boundaries and boroughs are delineated in colour. The key to these colours is provided, with a scale bar, at bottom right. 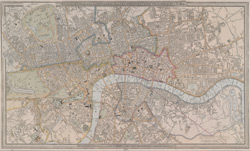 The map is a later edition of a map first published by Wyld in 1824, with the addition of the London-to-Greenwich railway. The line reached Bermondsey from Greenwich in 1836. Ten months later, the line reached London Bridge, making it the first railway terminus in the capital.